The VPR 470 optical reader is a specialised device designed to read OCR information contained in Machine Readable Passports, Visas, ID-cards and other travel documents. It captures machine readable codelines in single hand "swipe" operation and transmits recognised data to a host computer. 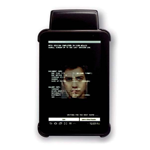 The VPR 470e variant uses built-in RFID reader to retrieve e-data from e-Passport and other e-documents. Bluetooth link is used for communication with external computer, for reader control and user-defined post-processing. VPR470/470e use built-in Li-Ion battery. No direct cable connection is required between the computer and the reader during operation. Small size and reduced weight of the reader makes it perfect choice for integration with handheld computers and smartphones. for Samsung Galaxy Tab 2 7.0.
for availability of other mounting options.